An email complaint is when someone receives an email from you and clicks the Report Abuse button on the Manage Your Subscriptions page. Q. Why does it matter that people complain? A. Your ability to get emails into the inbox is based greatly on the feedback that ESPs like Gmail and Outlook see coming from your subscribers. Things like opens and clicks on your emails help to increase delivery while complaints and subscriber inactivity hurt it. Q. Why would my subscribers complain? A. There are many reasons that recipients of your email could be complaining, we’ve outlined each below. Sending to a list that didn't ask to hear from you. 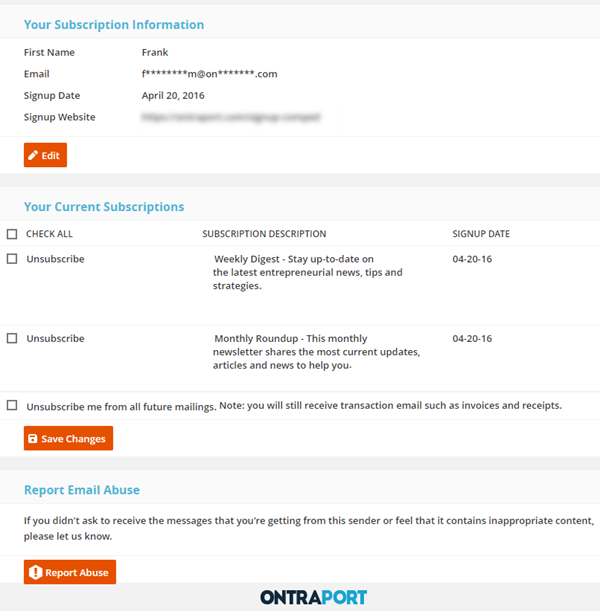 ONTRAPORT is a permission-based marketing tool. Sending email to anyone who has not specifically requested to hear from you is prohibited. If this is true of all or part of your list, we ask that you remove that portion of your list from the system immediately, especially any rented, purchased or harvested leads. Sending to a list that hasn't heard from you in a long time. Neglecting to mail your list for extended periods (weeks or months) can degrade your relationship with those contacts. As a result, they'll forget who you are and complain. If you haven't mailed your list in over three months, start by sending a completely pitch-free reminder email about who you are, why they should want to hear from you and invite them to opt-out if they're no longer interested. If it's been longer than 6 months, consider your permission expired and don’t mail the list. We also encourage you to reach out to our support team and ask about our easy-to-use active re-engagement campaign. Sending something other than what recipients expected to get from you. Permission is a sensitive thing. Always think about it from the perspective of your contact. If someone signed up to hear about knitting tips and you send them business tips, you're going to get complaints. If someone signed up for a free prize drawing and now you're sending them your newsletter it’s spam. Get it? Stick to your topic and stay relevant to the specific interests of your contacts. Take a close look at your opt-in pages and make sure that what you're sending is exactly what a reasonable person would expect to get from you after filling out your forms. Fulfilling expectations is key! Sending email with a hard-to-find unsubscribe link. Include an unsubscribe link at the top of your next few emails. You can do this by inserting the unsubscribe Merge Field into your messages. Q. How can I avoide complaints in the future? A. Create clear expectations on your sign-up forms and then fulfill those expectations. Also, never send email to anyone who didn't specifically ask to get exactly what you're sending. Q. Can my account be shut down for receiving too many complaints? A. If your account crosses our 0.1% maximum complaint rate we send a warning alongside some coaching advice to fix any issues that could be causing complaints. In special cases we’ll send out a second coaching email - however we rarely give a third chance. If you’re seeing a complaint rate that is higher than our thresholds you should take steps immediately to reduce them.